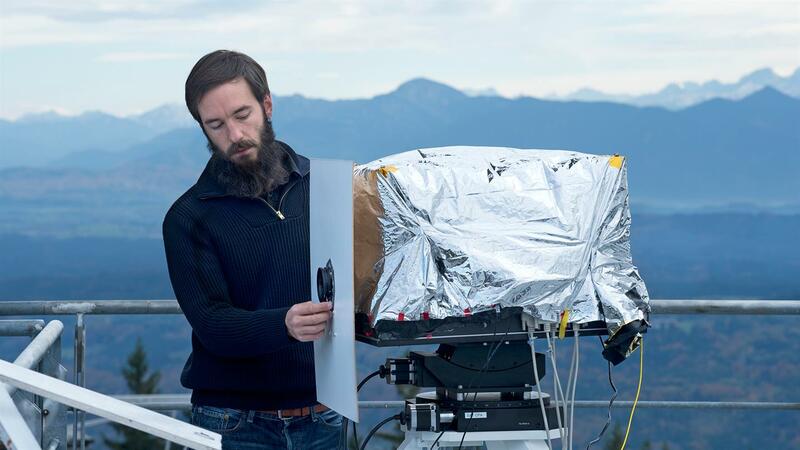 THRUST Project Leader Juraj Poliak with the THRUST reception terminal developed by the DLR Institute of Communications and Navigation, which was deployed during the long-distance experiment at the German Weather Service in Hohenpeißenberg. DLR scientist Ramon Mata Calvo with the THRUST transmission terminal developed by the DLR Institute of Communications and Navigation, which was deployed during the long-distance experiment at DLR’s site in Weilheim. Successful reception of 1.72 Tbit/s across 10.45 kilometres. Researchers from the DLR Institute of Communications and Navigation analysing the data together with the researcher from the Fraunhofer Heinrich Hertz Institute in Berlin, responsible for data generation and demodulation. The THRUST transmission terminal developed by the DLR Institute of Communications and Navigation, which was deployed during the long-distance experiment at DLR’s site in Weilheim. The THRUST reception terminal enables light to be coupled into the 10 micrometre optical fibres after travelling 10.45 kilometres. Researchers at the German Aerospace Center (Deutsches Zentrum für Luft- und Raumfahrt; DLR) have set a new record in data transmission using laser: 1.72 terabits per second across a distance of 10.45 kilometres, which is equivalent to the transmission of 45 DVDs per second. This means that large parts of the still under-served rural areas in Western Europe could be supplied with broadband Internet services. "We have set ourselves the goal of enabling Internet access at high data rates outside major cities, and want to demonstrate how this is possible using satellites," explains Christoph Günther, Director of the DLR Institute of Communications and Navigation. Fibre-optic links and other terrestrial systems offer high transmission rates, but are available predominantly in densely populated regions. Outside of the metropolitan centres a broadband supply via geostationary satellites is possible. This is where the scientists come in, with the development of an innovative transmission technology for next-generation communications satellites as part of the DLR THRUST (Terabit-throughput optical satellite system technology) project. The idea behind THRUST: The satellites should be connected to the terrestrial Internet via a laser link. The envisaged data throughput is more than one terabit per second. Communication with the users is then carried out in the Ka-band, a standard radio frequency for satellite communications. 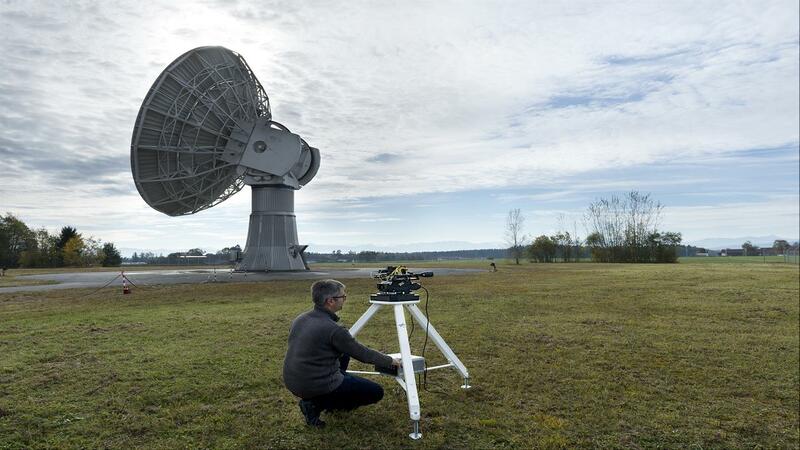 The first transmission attempts with such high data rates took place at the end of October in Upper Bavaria, with the scientists at DLR setting a record during the very first step. 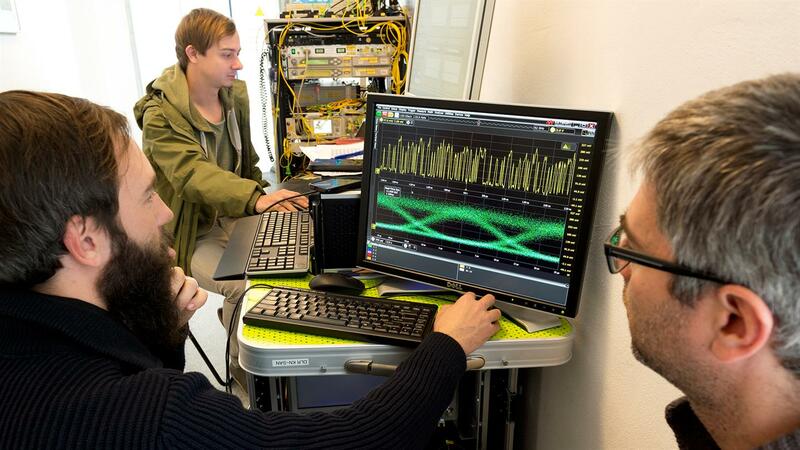 Along a route between Oberpfaffenhofen and Hochstadt, they achieved a world first when they succeeded in transmitting 1.72 terabits per second (Tbit/s) across a distance of three kilometres in free space. "The high stability of reception and the power reserves we had in the experiment across three kilometres encouraged us to take the next step," says project leader Juraj Poliak from the DLR Institute of Communications and Navigation. The data link between the ground and geostationary satellites is affected by the characteristics of Earth's atmosphere. Poliak and his team therefore developed a maximum load test for their system, which they established in simulations: The data link to space has, at its worst, the same interference as that encountered when transmitting across more than 10.45-km-long from ground to mountain in the test area between Weilheim and Hohenpeißenberg. The team performed the next set of experiments with the laser communication system along this route – with great success. After demonstrating feasibility in the 'worst case' scenario, the main focus of the DLR scientists is now on the stability of the optical link. 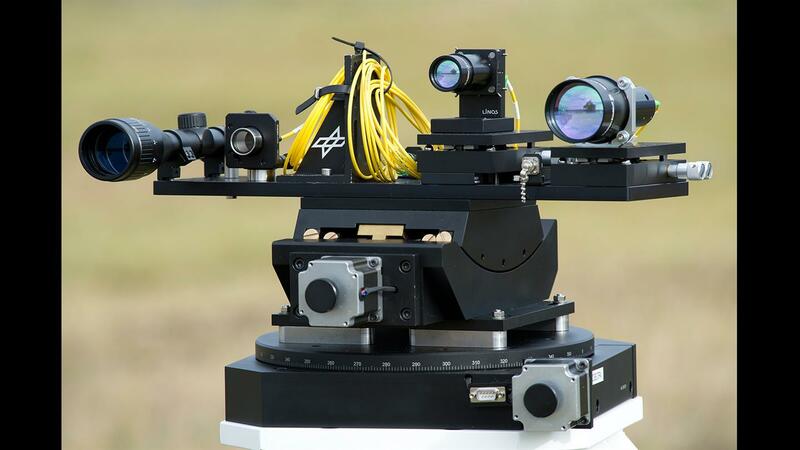 In a next phase, the scientists will therefore take measurements to better understand the effect of the atmosphere and enable stable, long-term laser communication with the satellite. "The stability of the connection is extremely important, as even a short interruption of only milliseconds can lead to the loss several 10 gigabits of data," explains Ramon Mata Calvo, head of the Optical Technologies Group at the DLR Institute of Communications and Navigation. With the new records, the scientists have successfully demonstrated that the vision of wireless optical data transmission in the terabit range is possible. 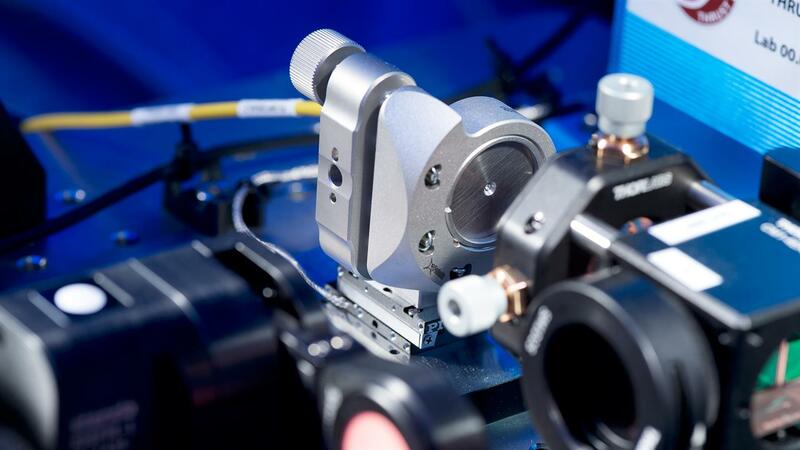 Within the framework of the experiments, a fibre-optic transmission system of the Fraunhofer Heinrich Hertz Institute was employed which operates at wavelengths of around 1550 nanometres and which is suitable for high data rates. This system was integrated into DLR's newly developed free-space optic transmission system. Employees of the Heinrich Hertz Institute supported the on-site tests. The very promising investigations are now being continued at DLR in Oberpfaffenhofen.